Q: Why did Bimputh come forward to sponsor this event? A: We wanted to showcase to the region that Sri Lanka has an active and significant microfinance sector, despite our small population. The SAMN conference brings together MFIs, policymakers and regulators from all over Asia and it’s not very often that Sri Lanka gets the opportunity to host an event of this nature. 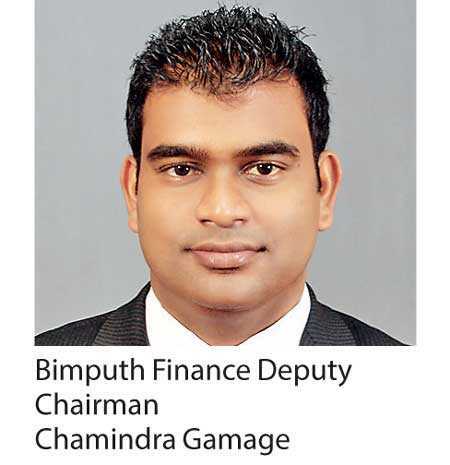 Q: Tell us a bit about Bimputh Finance? A: We’re a registered and listed leading micro financing solution provider and have about 150,000 clients spread across the length and breadth of the island. We have 57 branches and service centres in total. Q: What is your clientele like? A: We offer an extensive range of products including micro-enterprise loans, MSME, housing, personal, gold and agricultural loans focused on the low and middle income segments of the country. We specialise in micro and MSME lending and over 90% of our client base are women entrepreneurs. Q: Why is that you lend primarily to women? A: It purely for the reason that when it comes to loan repayment and working towards the sustainability of the family, women are far more responsible than men. Our clients can of course borrow on behalf of their husbands’ businesses where they are working alongside their husbands but the primary borrower is still our female client. Our female clients are very focused on improving their household and income conditions because as the family’s primary caregiver, we feel they understand better on minimising consumption spending and improving their savings. Q: How bad is the status quo with regard to the informal sector? A: There are tens of thousands of informal lenders otherwise known as ‘loan sharks’ lending at rates as low as 5% monthly to well above 30% per month. It is indeed a severe issue for our clients as they are motivated to borrow from informal money lenders at times of crisis such as when the floods affected the country and the ensuing drought that has impacted the North and North Central Provinces. They also employ unethical collection tactics but because they are very small on an individual basis media coverage in recent months have highlighted finance companies which are easier to identify. The players in the sector alongside the Central Bank have already introduced a Code of Conduct when it comes to handling clients and we at Bimputh conduct training programs for staff on customer relationship management. However, when clients borrow at rates as high as 10% monthly, no amount of income can support them in sustaining those high interest payments so they become more over indebted even though their informal borrowings will not be large sums of money. This in turn has a negative spillover effect on finance companies which are working towards supporting the low income segments who are mostly ignored by licensed commercial banks. One of the new products that has been introduced into the market is “borrow Rs. 10,000 today and pay Rs. 14,000 in 14 days” scheme. That’s 40% interest over a simple two-week period. Q: Do people actually fall for that? A: Clients in this income segment have urgent pressing needs including food, medical bills, etc. As a result, they are forced out of desperation to borrow from loan sharks and far less concerned about the rate of interest and more concerned about how quickly they can borrow. On our part, we work towards supporting their financial literacy and improving their business processes and discipline. We explain to them how interest rates are calculated and the consequences of over-indebtedness as well as the importance of saving for their future. Q: What makes Bimputh stand out? A: What differentiates Bimputh is our customer service and relationships with our clients. When the recent floods affected thousands of our clients and their businesses our staff were actively engaged on the ground in providing them with food, shelter, clothing and emotional support. We understand that the sustainability of our business is a direct function of our clients’ progress and the aim of conducting micro finance is not simply to lend and to collect but to monitor how our clients’ incomes evolve and support them through various programs focused on improving their income levels and supporting their communities. Every aspect of our costs are transparent and working with several international lenders and they enabled us to maintain robust processes. Clients who have been severely impacted as a result of natural disasters and general economic downturn in the past 12 months have been even financially supported to allow them to restart or expand their businesses. Q: What is your take on the microfinance sector in Sri Lanka? A: One of the biggest positives is that the sector has reached a level of maturity in Sri Lanka. However, there are a large number of players in the market and no client will refuse a loan which is offered to them. The Micro Finance Act has been introduced but regulation is necessary to prevent clients from borrowing from multiple players and falling into over-indebtedness. We are very conscious about this and if we believe the client’s repayment capacity is in doubt as a result of significant increase in borrowing we do not lend further but instead work to show them numerically their income to debt repayment position. Even though there are approximately 10 main players in the sector, there are tens of thousands of individuals and unlicensed organisations who are money lending at exorbitant rates and without regulation occurring at those levels, clients will always be at the mercy of high cost informal borrowing which is unsustainable. Q: Thoughts on the future of the industry? A: I think the future is bright as there is a plethora of services that can be offered to the low-income segments of Sri Lanka which have not yet been tapped, but regulation on the part of the Central Bank or self-regulation on the part of finance companies is imperative to prevent further increases in levels of over-indebtedness and multiple borrowing. The Central Bank is working with the players in the sector to ensure the sector’s stability and regulation would ensure that financial services companies are lending responsibly and ensure that only regulated entities can lend. This in turn would allow for better client servicing and lower interest rates in the long-term.